In our thinking capacity, our brain is capable to store the eternal picture of the cosmic world and that is why the brain of mankind may be brain cell the sample of the universe. It is interesting to note that bees learn while caring for their young in a bee hive. 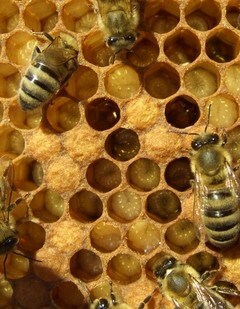 As long as they don’t have to leave the hive and fly out they are doing OK and their brain chemistry supports learning. Why would bees age so fast on a flying mission? Is it a requirement of a flight, social isolation or a mundane food gathering activity that kills all their creativity and learning? Or is it a stress related to the food gathering mission or a lack of stimulating hive activity (like caring for larvae)? Remember that bees located outside of their favorite environment (shelter) age surprisingly fast. It’s definitely related to the stress associated with flying. A bee will flap it’s wings over 200 times a second, and forage up to 7 miles from the hive. That’s fourteen miles round trip, and they can take up to 30 trips per day if needed. Factor in weather and elements, and a payload up to 85% of a bee’s body weight, not to mention the intense caloric requirements of flying, and you’ve got some hefty wear and tear! Imagine doing that to your car! Once a bee is old enough to be a forager, their lifespan is only 5-30 more days on average. In additional to all that, the scientific reasons for bees needing to be older to forage are somewhat lengthy and complicated. They have certain physiological traits while they are younger that make them better suited to life in the hive. For example, hair quantity (presumably for tactile reasons, hives are dark places!) and specific bodily secretions. Additionally, wing and muscle development is crucial, and they need to actually learn HOW to fly. Once they’re old enough to fly, a bee will spend a LOT of time learning to fly, exercising their wings, and even learning their way around the area. Bees are very good at getting lost if they fly away too early! On top of all that, bees use pheromone signals for nearly everything. Each hive has a distinct smell, which bees use to find their way back to the right hive. Flying to the wrong hive can potentially be fatal. The time in the hive while younger acquaints bees with those smells. There’s a lot more I could talk about, but I hope this is sufficient! So bee’s are not trapped by aging. Let me repeat that bees are not trapped, bbbeez are not trapped. Does this mean I get to change diapers again? Perhaps my wife could try nursing our infant grandchildren. I thought once I raised my own kids I was done. This study implies otherwise. I hate it when they do that to me! So in theory, this means one should visit grandparents/great-grandparents very often!